This 110 page ebook is a truly comprehensive resource that will familiarize you with every step in the process of creating great hypnosis and meditation recordings. Written by Christopher Lloyd Clarke B.Sc, D.Msc, this is the definitive guide for every therapist and healer. Please click for detailed information and download instructions. 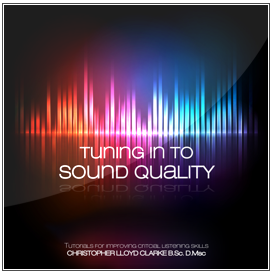 A special supplement to the abovementioned ebook, this free tutorial will greatly improve your ability to discern between good quality and bad quality recordings. 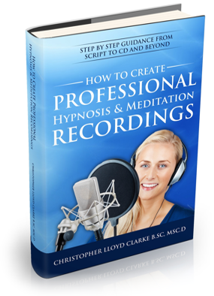 Selected content from the ebook - How to Create Professional Hypnosis & Meditation Recordings. Never before has there been such a strong demand for hypnosis and meditation recordings, and it's never been easier to create them. There are some very compelling pros and cons to each of these options, and a third option also exists that might just be the perfect choice for you. A thorough summary of the equipment you will need to record your voice, mix it with music and produce a finished audio file. Content for this chapter is only available in the free ebook How to Create Professional Hypnosis & Meditation Recordings. Regardless of whether you choose to record your voiceover at home with your own equipment or at a professional studio, the following tips will help you to capture a nice clear recording while expressing yourself in the most appealing way. "Copyright law”. For most of us, those two words are as dreary as they are misunderstood. In truth, the basics of copyright law are pretty easy to understand, as this article demonstrates. Well worth a few minutes of your time. If you use your music to create a YouTube video, then at some point you’ll probably receive a “Copyright Notice” from YouTube. These notifications are very common and can be unnerving as they give the impression that the music you used in your video is a breach of copyright law. This article will put your mind at rest, explain why these copyright notifications appear, and how to deal with them quickly. Without proper care, your recordings may cause other people's recordings to be burdened by false copyright claims. How this happens and how to stop it is explained here. Music can have such a profound effect on us, so how can we use this to our advantage? What can the study of psychoacoustics teach us about creating music that encourages states of deep relaxation and how can we use this to our advantage in therapeutic situations? Hypnosis music versus meditation music. What's the difference? At Enlightened Audio we have listed meditation music and hypnosis music as separate categories. It would have been very easy to simply group them together as "relaxation music", so why the division and what's the distinction between them? What is brainwave entrainment music, and how effective is it REALLY? A thorough and honest exploration of brainwave entrainment music, its uses and effectiveness.